– Last year’s Winton event saw Todd Kelly make Saturday’s Top 10 Shootout, with Rick Kelly then smashing the qualifying lap record with Kelly Racing’s first ever pole position on Sunday. The pole time set by Rick Kelly’s #15 Jack Daniel’s Commodore last year was achieved on Dunlop’s soft compound tyre, which will be used exclusively in qualifying and racing on both Saturday and Sunday this weekend. – Should rain descend on Winton this weekend it will not faze Jack Daniel’s Racing, with podium results coming in wet conditions at last year’s Sydney Telstra 500 (Rick Kelly third on Saturday), this year’s Clipsal 500 (Rick Kelly second on Sunday) and the recent ITM400 Hamilton (Rick Kelly first and Todd Kelly third on Saturday). “Winton is my home track in that it’s not that far from Albury,” said David Reynolds. “It’s also been my test track for about 10 years, right through my time in Formula Ford, Carrera Cup, Fujitsu Series and V8 Supercars. “I’m feeling confident for Winton following our test day last week. Murph especially found some speed from his car so hopefully I can use his information to my advantage. “Our cars still have a way to come on soft tyre. I’m actually glad that I get to go out for all four sessions on Friday so that we can test some things on the Stratco Commodore. “We are not 100 percent sure of what the weather will do but Winton is a pretty tricky track in the wet, so if it does rain you need to be on your toes. “It’s nice to test at Winton last week to learn set-up and get sharp for this weekend,” said Greg Murphy. “It’s always difficult to judge the success of a test day until you get to the next race meeting, put the car on the track and compare your pace to everybody else. “But we certainly came away happy with our test day. We achieved quite a bit so we’re very keen to follow through on all of that this weekend. “I’ve been around long enough to have test days that have reaped massive benefits and others that haven’t really helped. “The team is on the rise at the moment and we’ve really knuckled down and analysed what we learned from the test day and we feel that we have made gains. “We don’t really know if it is going to rain this weekend. We will just talk about it a bit and take it as it comes. “You really have got to wait and see what the weather is on the day and just be ready to throw wets on the car and react to the conditions. 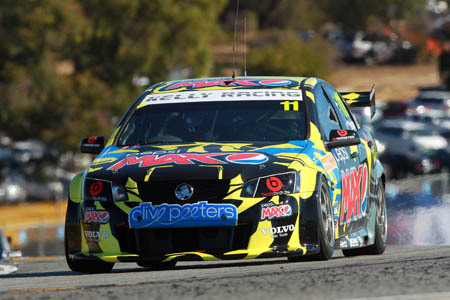 “Our pole position and lap record at Winton last year was a real highlight for me and the whole team,” said Rick Kelly. “Our soft tyre pace in the races is still where we lack the most. I think our hard compound tyre pace is generally right on the money or pretty close to it. “As soon as we bolt soft tyres on, our tyre wear is worse than others and we tend to fall back as the race goes on. “At our test day at Winton last week we spent a lot of time working on our soft tyre set-up, not only to go fast but also to look after our tyres. “We tested at Winton last week and you don’t normally get the chance to test at a track just before a race,” said Todd Kelly. “It’s been handy to spend the day there so close to the race. We ended up trying some different things on the Jack Daniel’s Commodores and hopefully that gives us a bit of a head start when it comes to the race weekend. “Winton is a place that can be hard to read in terms of how much it changes with the track conditions, the weather and what time of day we are on-track for qualifying or racing. “We are potentially going to have four or five set-ups to choose from depending on what all those conditions are at any given time.